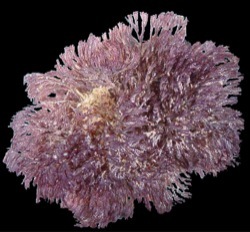 Cryptosula pallasiana is a colonial animal that grows in flat, encrusting sheets on a variety of substrates including shells, rocks, wood, glass, plastic, cement, seaweeds, sea grasses and solitary sea squirts. On flat surfaces the colonies may be more or less round and several centimeters across. In Florida, the edges of some colonies are raised in frills. The individuals within a Cryptosula pallasiana colony are called zooids. A zooid's soft tissues are called the polypide, which lies on its back in a rigid, rectangular or coffin-shaped box, called the zooecium (Greek for "animal house"). Each zooecium is 0.4-0.5 mm wide and 0.6-1.0 mm long, and they are packed side-by-side and end-to-end in the colony, radiating outward from the initial "founding" zooid. 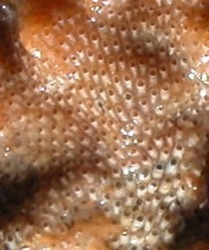 The "foot" end of a zooecium generally points toward the center of the colony, and the head end toward the colony's outer edge. 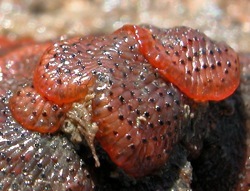 The overall color of the colony is white, orange or pink. 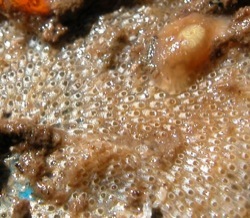 Orange, pink or yellow embryos are sometimes visible within the zooecia . Some of the following details can be seen with a hand lens; others require a microscope. Cryptosula pallasiana feeds with a crown of tentacles, called a lophophore, that surrounds the mouth on the head end of the polypide. 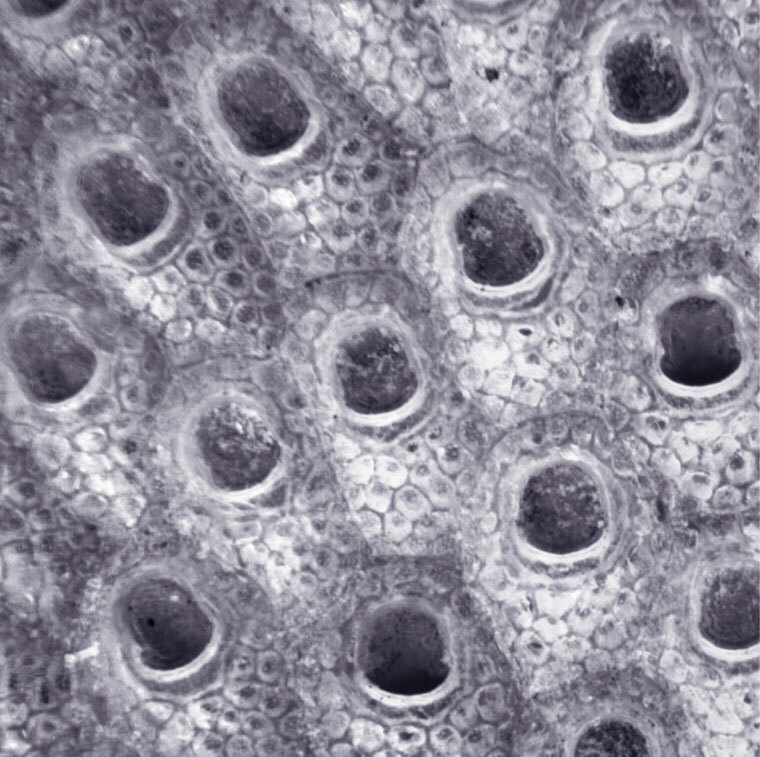 The tentacles have rows of cilia arrayed along their inner faces and sides. To feed, the lophophore and upper end of the polypide are pushed out of the zooecium through an opening called the aperture, which is on the zooecium's upper surface near its head end. The tentacles are held stiffly, forming a sort of cone-shaped funnel with the mouth at the bottom. Currents produced by the beating of the cilia carry food particles (primarily microscopic plankton) down along the tentacles to the mouth. In Cryptosula pallasiana, the aperture is in the shape of a round-cornered square or squat rectangle that is pinched in a little on the lower part of the sides. It has been described by different authors as bell-shaped, horseshoe-shaped or keyhole-shaped. 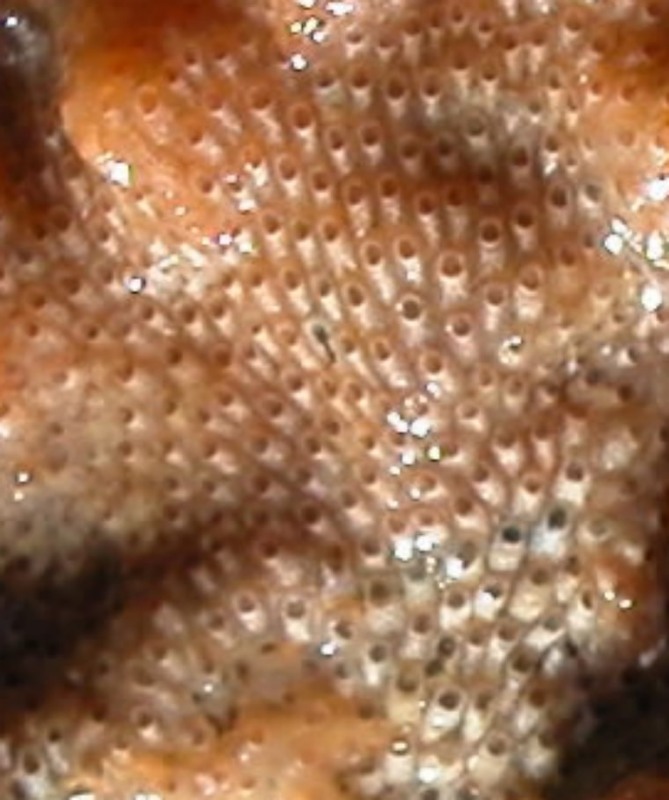 The upper surface of the zooecium is covered by large pores, both below and above the aperture. The zooecium's upper surface is sometimes raised into a small bump or hill just below the aperture. Cryptosula pallasiana has no spines, no avicularia (structures with a jaw-like element that opens and closes) and no ovicells (specialized structures for brooding embryos)—elements that are conspicuous features in many bryozoans. Cryptosula pallasiana is eaten by various nudibranchs, sea urchins and fish. 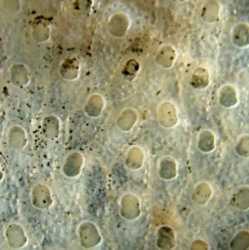 Cryptosula pallasiana's relatively large, bell-shaped aperture, and the large pores on its upper surface occurring above as well as below the aperture, distinguish it from all other encrusting bryozoans on the Pacific Coast. Native to the Atlantic, where it has been reported from Norway and Great Britain to Morocco, in the Mediterranean and Black Seas, and from Nova Scotia to Florida, though Carlton and Ruckelshaus (1996) list it as introduced to Florida. In Puget Sound, Cryptosula pallasiana has been collected from several sites in southern Puget Sound and at Blaine near the Canadian border. In San Francisco Bay it occurs from the mouth of the bay north to San Rafael and Point San Pablo and south to Redwood Creek and San Leandro. Cryptosula pallasiana was first reported on the Pacific Coast in the mid-1940s in Newport Bay and San Francisco Bay. It was likely introduced either as hull fouling or with shipments of Atlantic oysters, with which it occurs on the Atlantic coast. Since its larvae spend a very short time in the plankton, it is a poor candidate for inter-oceanic transport by ballast water. As discussed above, Cryptosula pallasiana has primarily been moved about either as hull fouling or, in some cases, possibly with transfers of oysters or other shellfish. Carlton, J.T. 1979. History, Biogeography, and Ecology of the Introduced Marine and Estuarine Invertebrates of the Pacific Coast of North America. Ph.D. thesis, University of California, Davis, CA (pp. 720-722). Carlton, J.T. and M.H. Ruckelshaus. 1996. Non-indigenous marine invertebrates and algae. Page 187-201 in: Simberloff, D., D.C. Schmitz and T.C. Brown (eds. ), Strangers in Paradise: Impact and Management of Nonindigenous Species in Florida. Island Press, Washington, DC. Cohen, A.N. and J.T. Carlton. 1995. Nonindigenous Aquatic Species in a United States Estuary: A Case Study of the Biological Invasions of the San Francisco Bay and Delta. U.S. Fish and Wildlife Service, Washington, DC (p. 108). A Cryptosula pallasiana colony on the underside of an intertidal rock in San Francisco Bay, partly overgrown by an orange bryozoan (Schizoporella unicornis) at lower right. Cryptosula pallasiana on a floating dock in San Francisco Bay, with an anemone (Diadumene sp.) growing on it at upper right. Even at this scale, Cryptosula’s large apertures are clearly visible. 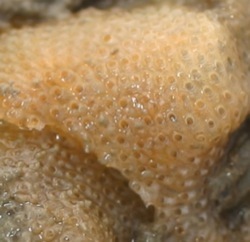 Detail of a Cryptosula pallasiana colony in San Francisco Bay. 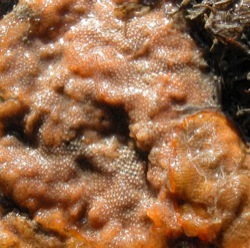 Detail of another Cryptosula pallasiana colony in San Francisco Bay. 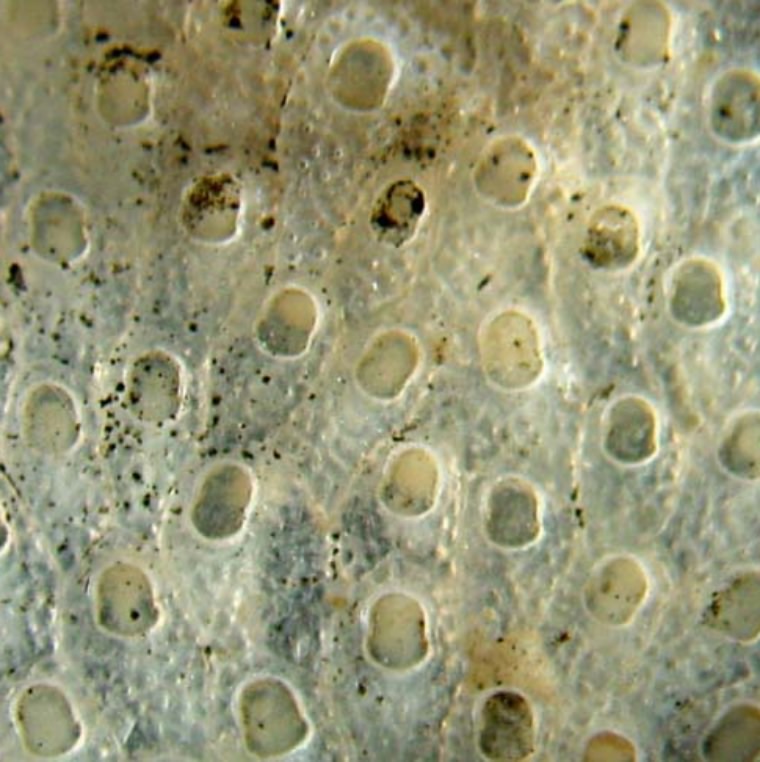 Microscope detail of a Cryptosula pallasiana colony from San Francisco Bay. Note the rounded rectangular outline of the aperture, with slight indents on the sides; and the large pores perforating the upper surface of the zooecium. Microscope detail of a Cryptosula pallasiana colony in San Francisco Bay.